You took charge and hired the right players. Now, what? How can you be successfully leading through change? Once you have the right players on board of your leadership team, the question becomes how to align everyone with your vision and how to build a high performing team based on trust and respect in a fast-paced and ever changing environment. Much like in sports, individual, strong contributors are never as successful as a well-aligned high performance team willing to go the distance to the championship. An athletic team would never dream of going to the Olympics or the Super Bowl without the right team of coaches to hone everyone’s skills and identifying a proper strategy to reach alignment, implementation and ultimately reaching the goal. You are off to a good start, but somehow the team is not quite on the same page. Resentment, lack of trust, and lack of alignment are challenges that are easy yet costly to ignore. This fast-paced, interactive and highly participative program allows leaders to raise their level of awareness about themselves and their team members through practical projects, central discussions and regular feedback. While the projects are not industry specific, they are highly relevant to building high performance teams. 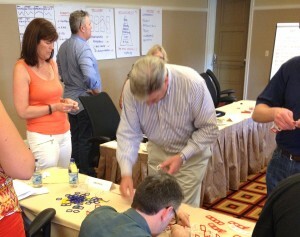 John Eaton and I have facilitated Leading Through Change with multicultural teams in Switzerland, the United Kingdom, and California in various different industries. The principles are the same. The focus is on the leader and his team. Are you interested to find out more? Are you curious how you can use this program as a foundation for team success? Contact me directly to discuss how we can custom tailor a program that your team will refer back to again and again. It is truly transformative.